Secretly Sentimental? Khloe’s A Cancerian Chick! Khloe Kardashian was born the 27th June, 1984, when the sun, Venus and Mercury were in the zodiac sign Cancer, and Mars and Saturn were in Scorpio – she’s a water babe through and through! Known as the most sentimental sign, Cancerians are often dubbed as overly-emotional, moody types – the crybaby of the zodiac. I’m not sure that I’d label Khloe as true to form on all accounts but she is a home bird, and likes being close to the family. She’s also taken to motherhood and is super close to baby True, born April 12th 2018. True Thompson is a bundle of Aries fun, with moon and Neptune in Pisces! She was born when Saturn was on Khloe’s Jupiter, suggesting a responsible chapter in the stars life is being cemented. During her pregnancy Khloe had Saturn opposite her sun, and got criticised for saying she planned on eating her placenta after giving birth. How ironic, since the Greek myth of the Cronus (Saturn) was that (fearing he’d be overthrown by one of his children) ate each one upon their birth! Whether she was joking or not it’s a funny play on stories. Family is usually a priority for the security conscious Cancer, and even with a curious, flighty moon in Gemini, the emphasis is still on settling down, though perhaps in an unconventional nest. With moon in the dynamic constellation of the Twins (but in the zone of home, the fourth house) Khloe will appreciate a household full of chatter, stimulation and a bright and breezy vibe. With the Moon in air sign Gemini a lighter energy is expressed alongside the emotional Cancer temperament. This placement indicates an active, curious and even restless mind, however with Mercury sitting with Venus Khloe delivers her wit with smiles and a twinkle. These people are born communicators, quick and humorous, they like to socialise and need to keep busy. Far from boring they love change and are themselves very versatile – and super funny! Khloe is an Aquarius Rising star, giving her a very quirky, different and alternative approach to life. 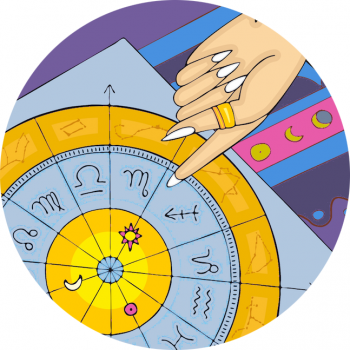 Her ruling planet –Uranus– is sitting with the point of public reputation in her birth chart – the Midheaven. Aquarius is a progressive, revolutionary sign, and those born with Aquarius strong in their charts often feel different, alien or ‘the outsider’. Perhaps of all the sisters Khole feels most out of sorts in the limelight. See all the KARDASHIAN STAR SIGNS, here.